Almost ten years ago I moved from a large city to a speck of an island in the Irish Sea. That first year on the Island I taught myself how to make cold-process natural soap and then started selling it through the local farmers market. I also found out pretty quickly that sourcing soap supplies at the right price was going to be tricky. If a supplier could ship to me then postage fees were often expensive. More often than not companies wouldn’t offer shipping though. That meant that I had to get creative and proactive in finding ingredients to make soap. From that point until now I’m still making and retailing handmade soap but I also teach in-person soap making lessons. This guide includes my tips and ideas for helping you to source ingredients to make handmade soap. Whether you’re a beginner or a more advanced soap maker, Lovely Greens is filled with creative natural soap making inspiration. As a soap maker I like to make simple yet beautiful soap using herbs, flowers, and other natural ingredients. 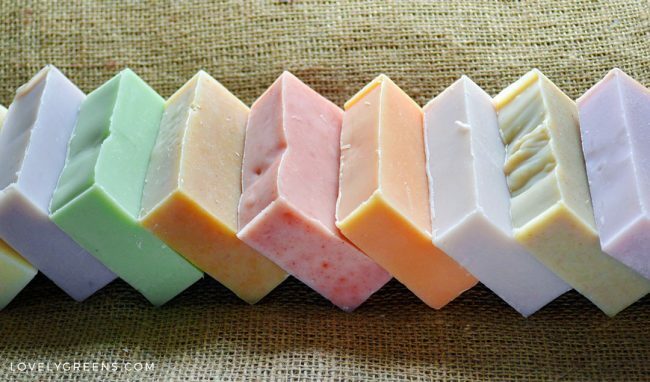 Simple soap making for simply stunning soaps. If you’re interested in learning more, check out the ideas below and also subscribe to my weekly newsletter if you’re not receiving it already. 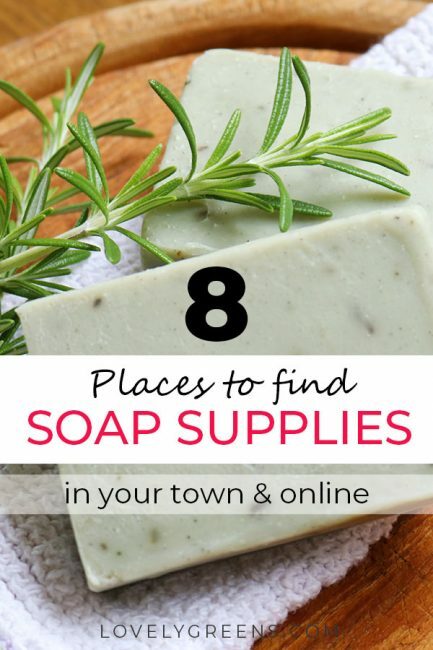 With your subscription you’ll receive a free pdf of this piece on finding soap supplies. There’s no better way to pay homage to your community than making soap using local ingredients. 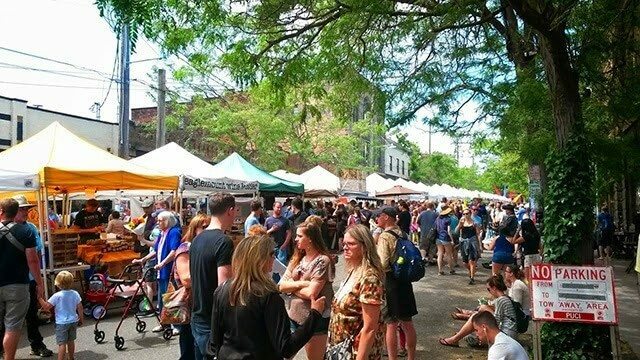 Farmers markets are one of the best places that you can find them too! Not only can you have a shop around for incredible edibles but you see what’s on offer for creative natural soap making. You could even offer special seasonal soaps based on what’s available: pumpkin soap, apple juice soap, fresh peppermint soap. The sky’s the limit when thinking up seasonal variations and ideas. Herbs & veggies: use fresh produce as purées or infusions in soap. Fruit and vegetables are a fun and creative way to color and decorate handmade soap. You can stir in purées of spinach or pumpkin, or make chamomile or calendula flower tea and use it as the water in your recipe. There are just so many ideas. Local honey: Honey and beeswax are often at farmers markets. Both beeswax and honey are great additives in soap. The former can be used in small amounts to harden bars and honey can both color and scent your bars. It’s also very hydrating and can help increase lather. Using local honey will also make your soap all the more special. Goat milk: Handmade milk soap is both sensitive and creamy. Milks of any kind can be added to handmade soap but Goat Milk soap is one of the more popular types. It’s rich and creamy and helps increase lather too. If you can find local goat or cow milk, use either in your soap. You can also use other types more specific to your region. If you’re thinking about making handmade soap as a business then you’ll need a steady supply of ingredients. 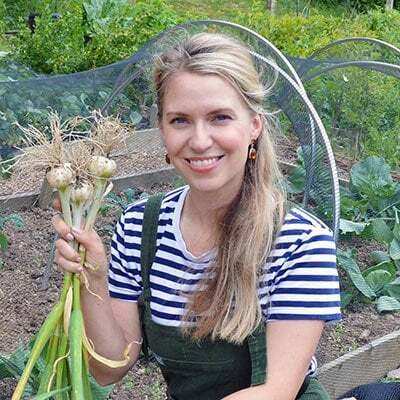 While you’re at the farmers market, collect business cards or take photos of the contact details for local producers. Have a chat too and see if they’d be interested in supplying you with the soap supplies you need. Remember that some products will be seasonal and others might run out of stock quickly. A direct supply is better than trying to fight the crowds. Beeswax: Used for hardening bars. As a beekeeper myself and knowing many personally, I know just how much beeswax ‘by product’ is produced when keeping bees. I buy it in bulk and offer prices for low, medium, and high quality beeswax. This price reflects how much time I’ll need to clean and process it for soap & beauty. 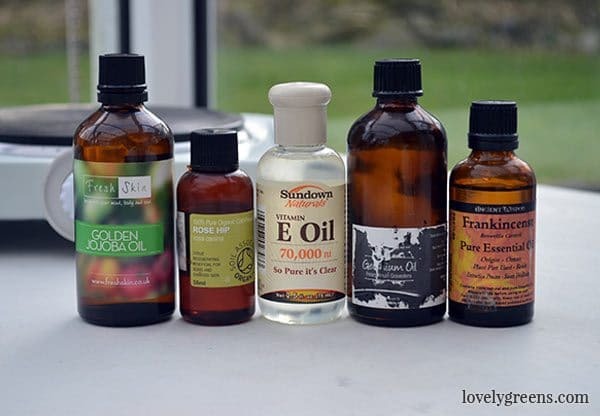 Local oils: Fine oils to use when superfatting your soap. In many regions there will be a specialty oil that’s grown and/or pressed locally. In my case it’s rapeseed oil. In others it may be local olive oil, grape seed oil, sunflower oil, or others. 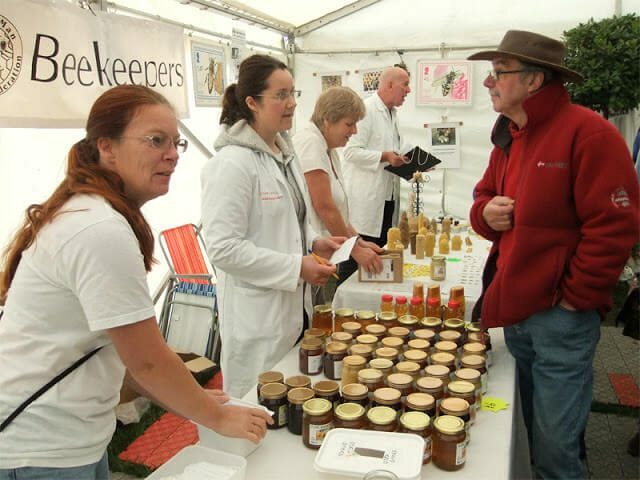 Get in touch with the farmers or producers to see about working together. Botanicals: Herbs, flowers, & produce. If you’re lucky enough to have a lavender farm nearby, or a producer of medicinal herbs then definitely get in touch. Just imagine the possibilities of sourcing local flower petals, therapeutic herbs, and in some cases, locally produced essential oils. The supermarket is a great place to shop for soap supplies if you’re making small batches at home. Oils in particular are easy to find including olive oil, sunflower oil, canola oil, avocado oil, and even blocks of lard. A word of caution though — check the best by dates of each before purchasing. Oil that is past its best-by date can cause all kinds of issues in handmade soap. Make sure that the best-by date is at least a year from the day you purchase it. Oils: Supermarkets are great for their range of oils. Many of the same oils that we use in cooking can be used to make handmade soap. 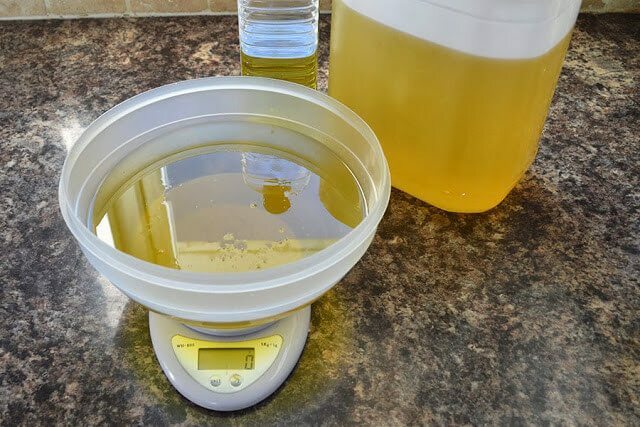 Use the more expensive cold-pressed oils for ‘Superfatting’ and the larger bottles of olive or sunflower oils as the main oils in your recipes. 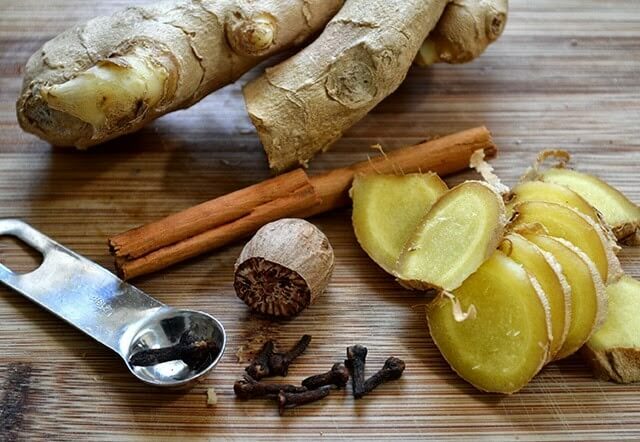 Spices: Some spices can be used to naturally color soap. If you’d like to use natural colorants in your handmade soap, start by using spices. Paprika, Turmeric, Cinnamon, and others can be used in small amounts to tint your bars shades of yellow, orange, and brown. Dried Herbs: Use dried herbs to add visual interest in handmade soap. While you’re perusing the spices, have a look at some of the dried herbs as well. 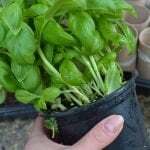 Parsley, dried or fresh, can tint your soap green, and the dried peppermint in tea bags can be blended into handmade peppermint soap. It’s convenient that many edible ingredients can be used to make skin-loving handmade soap. Health food stores can be even better at sourcing soap supplies since they tend to stock higher quality, organic ingredients like liquid oils, coconut oil, cocoa butter, beautifully scented essential oils, raw honey, clays, oatmeal, and many bulk herbs and spices. They also usually have a stock of handmade soaps that you can get inspiration from. Smaller shops might even be able to order specialty ingredients in for you. 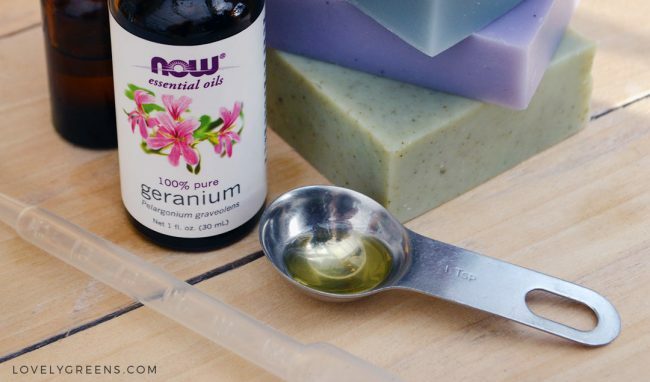 Essential oils: Scenting handmade soap. Almost every health food store will have a beauty and supplements section stocked with small vials of essential oils. Though you can get larger bottles cheaper in other places, the smaller 10/30ml bottles are perfect for small batches. You can often find a tester to ‘smell before you buy’. Quality solid oils: Cocoa butter & Coconut oil. Rich oils like cold-pressed coconut oil and cocoa butter are used in healthy desserts. Both can be a little pricey so use them in small quantities to superfat your soap. Use less expensive refined coconut oil for the base oil in your recipes. You can sometimes find it at health food stores too. Oatmeal & Rolled Oats: Bags of organic oatmeal and other bulk foods. Oatmeal is a fantastic ingredient in handmade soap. You can sprinkle rolled oats on the tops as decoration or add oatmeal infusions for extra creaminess. Health food stores have a great selection of different organic oats that you can use in various ways to make handmade soap. 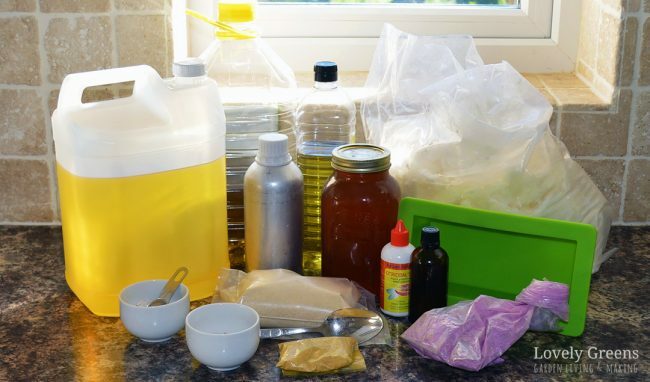 The bulk of your soap making supplies will be oils. Some of the more common types include olive oil, coconut oil, sunflower oil, canola oil, and palm oil. Most of these can be found in the bulk oil sections at wholesale food suppliers like Costco. You might also be able to find Sodium hydroxide (also called lye or Caustic soda) if you ask. You may be required to show ID when purchasing it. Also look at the kitchenware they have. You might be able to find silicone moulds, scales, stick blenders, & other equipment. Olive oil: Both extra virgin olive oil (EVOO) and pomace olive oil can be found at wholesalers. Be attentive to the best by dates of both and also make sure that any pomace olive oil isn’t blended with another oil. You’ll often find ‘Pomace olive oil’ that’s mixed with soy oil or sunflower oil. 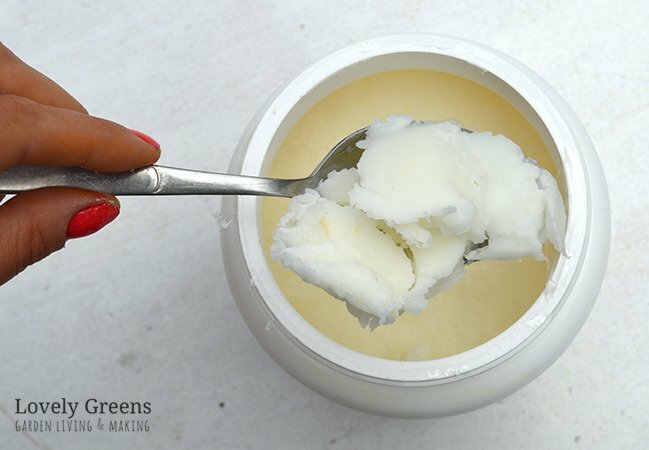 Coconut oil: Inexpensive cold pressed coconut oil. If you purchase a tub of cold pressed coconut oil at the health food store it might end up being way more expensive than buying a larger size one at a wholesaler. You can sometimes check prices online to compare. Palm oil: A much used but controversial oil. Large boxes of palm oil are common and inexpensive at wholesalers and it’s an oil that’s commonly used in soap making. There’s a catch though — palm oil is directly linked to the mass destruction of rainforests. Many people will choose not to use it for this reason. Refined coconut oil: The coconut oil that you’ll find in supermarkets is often cold-pressed and smells and tastes of coconut. Refined coconut oil does not and is used in healthier food frying — it’s also much less expensive and can often be found or specially ordered by ethnic food shops. Bulk spices & herbs: Large sachets for half the price of other shops. Most of my kitchen spices come from ethnic food shops and they can be used in soap making too. Often found in large sachets, you can pick up turmeric, paprika, annatto seeds, and even ratan jot (alkanet root) at quite a discount. Exotic produce: Fresh fruit, roots, and leafy greens from a world away. It’s really a treat to have a look through the fresh produce on display at some ethnic food shops. It’s only here that you can pick up fresh turmeric, lemongrass, and unusual types of fruit and vegetables. It’s fun to use them to experiment and maybe you’ll even discover a new soap idea! You’ll notice that in many of my soap making recipes that I link to Amazon for ingredients. 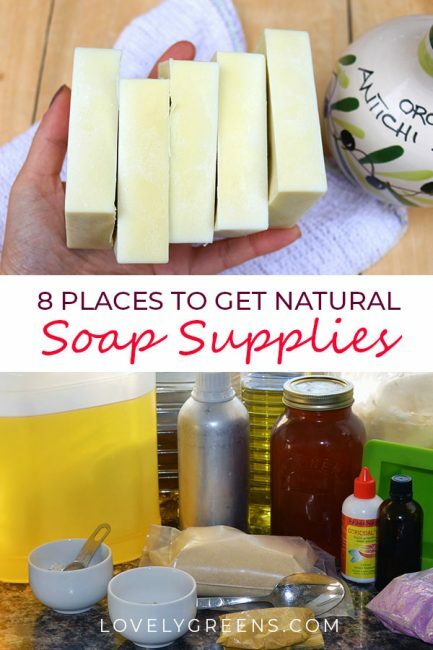 One reason is because it’s just such an easy and convenient place to pick up small quantities of soap supplies. These include hard to find oils, essential oils, natural colors, and other ingredients. When shopping online, just make sure that the seller and brand is reputable and read the reviews. You can save on shipping if you purchase ingredients from the same seller. Sodium hydroxide: Lye can be difficult to source. It used to be that buying Sodium hydroxide was easy but these days, it’s become more difficult. Some places will still sell it in small quantities (sometimes with ID), but it’s easier to find online. Look for ‘Food Grade’ Sodium hydroxide from reputable sellers. Essential oils: Less expensive than in health food stores. You can find the same bottles of essential oil from the health food store online for considerably cheaper. Have a shop around and pay attention to the reviews and ratings when purchasing your natural fragrances. Bulk oils: Let the mail man do the heavy lifting. Some oils can easily be sourced from a local shop whereas others are more difficult to find. Shea butter and refined coconut oil come to mind. Both of these can be purchased in small to large quantities online and often come with free shipping. I live a boat ride and/or flight away from any physical soap making suppliers so I’ve only ever stepped foot inside one ONCE. Talk about a kid in a candy shop! Unfortunately I had to fly back to the Isle of Man from a foreign country so was limited on just how much I could splurge on. Many soap making suppliers have online shops though too. They’re an invaluable resource for ingredients, especially if you’re making soap that will be sold as a product. All the ingredients they’ll offer will come with proper batch codes, MSDS sheets, and other information you’ll need when making commercial products. Not only that but each will be researched by those more in the know than most of us will ever be. Reputable soap making suppliers can save you a lot of time and hassle in trying to find what you need to make handmade soap. Bramble Berry: has both a physical shop in Bellingham, WA and an online shop. Bramble Berry is one of the most well-known soap ingredient retailers and has an extensive selection of soap supplies. 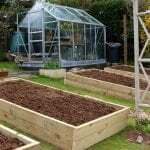 Bulk Apothecary: also with a shop, Bulk Apothecary is a leading supplier of essential oils and natural soap making supplies. 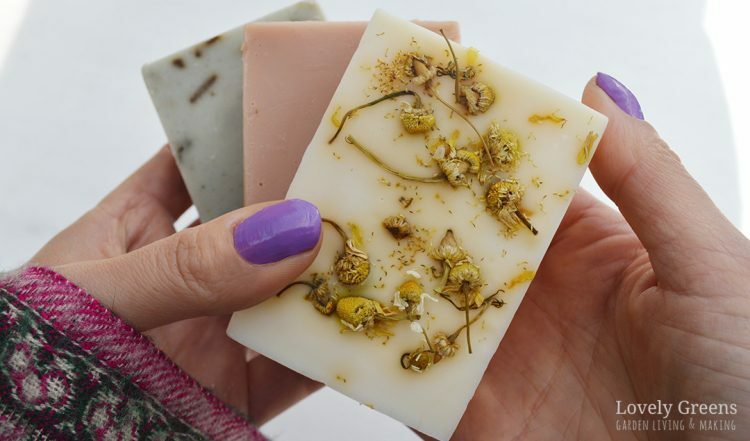 Mountain Rose Herbs: High quality soap supplies from a company that values conservation, fair trade, and sustainable packaging. Canwax: one stop shop for Canadian soap makers, Canwax supplies practically everything you need to make handmade soap. Ships to Canada, the USA, and the UK. 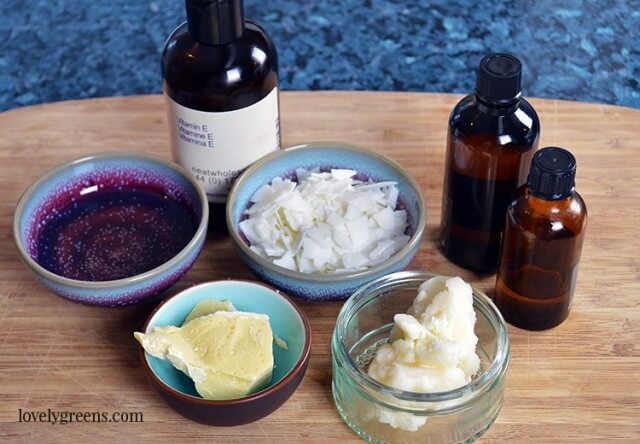 Cranberry Lane: ‘Everything you need for DIY Natural Beauty Products’. 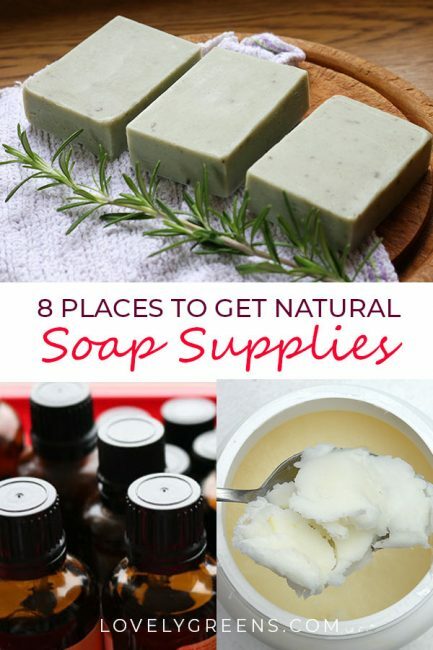 They have a good selection of raw soap making ingredients, diy kits, and other beauty supplies. Voyageur: Though they don’t have as large a selection as the other two Canadian suppliers, they have a decent selection of soap making staples. Just a Soap: a decent selection of soap making oils, essential oils, and other ingredients. Not as extensive as Soap Kitchen but still worth having a look at. If you subscribe to Lovely Greens, you’ll receive this piece as a free downloadable PDF. Head over here to sign up.